Gracing the entrance to the Mediapark, where most Dutch radio and TV programmes are devised, recorded and broadcast, this is the flagship of the Dutch broadcasting world. The Netherlands Institute for Sound and Vision is as much a museum for the public as an archive for researchers and broadcasters. It is a cube half below and half above ground, the two parts penetrated by a pair of light wells set at right angles. 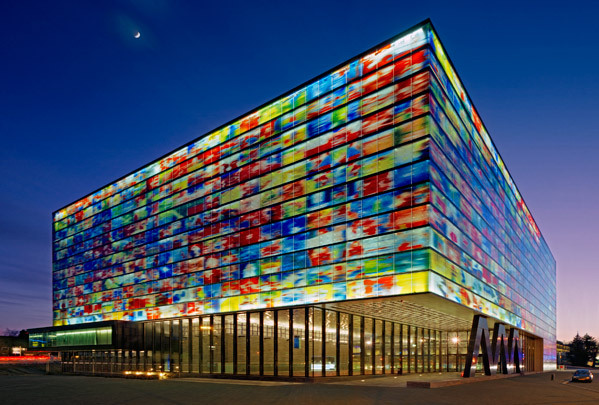 The public portion is partly presided over by designer Jaap Drupsteen's glass facade in which various key moments in Dutch media history can be read, and partly by the Media Experience, a stepwise rising volume clad in gleaming aluminium panels high up in the atrium. Visitors to this interactive exhibition can absorb the history of Dutch broadcasting in screening rooms and audiovisual themed areas. The walls of the large film theatre can be illuminated in every colour using LED lighting. A 'canyon', once again in a stepwise arrangement, descends to access the four underground levels of archives where 700,000 hours of radio and TV excerpts are stored. There is also a neutral rectangular volume clad in grey sandblasted glass containing offices. A bridge leads from the main entrance across the archive canyon to the central plaza from where the various components can be reached. The cafeteria steps down in tiers to a terrace above the reflecting pool.